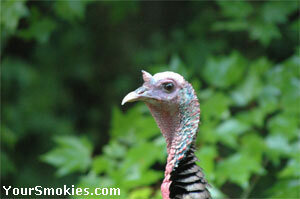 Wild turkeys are in Cades Cove year round. 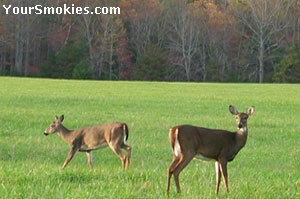 Deer in a Cades Cove field with fall colors. Soon you will come up to marker number 2 which brings you to Sparks Lane which is the first of two gravel roads that cut through Cades Cove in a North to South direction. These 2 lane gravel roads going North to South allow 2 way traffic so they are useful to cut a drive short if the weather doesn't cooperate or if the traffic on the loop is too heavy. I use both Sparks Lane and Hyatt Lane to allow me to circle back into the beginning of the loop from the back end the Cove. Sparks Lane has actually been part of the Cades Cove road system since the 1840s and was named of Sam, Tom and Dave Sparks which were three brothers who were livestock herders in this area. If you pull into Sparks Lane and go halfway in and just stop, it isn't hard to imagine what life was like a hundred of yeas ago in the valley floor where horse drawn carriages traveled in this very spot. A few hundred feet past Sparks Lane on the right hand side you will come to a parking area for The John Oliver Place. This one of the most visited cabins in the park and is set far back from the road. If the parking area is filled, pull further up to the auxiliary parking area for the John Oliver Cabin. 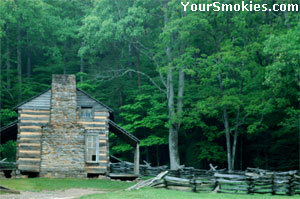 John Oliver who built this cabin, lived in Cades Cove for almost 10 year before he bought this property in 1826. 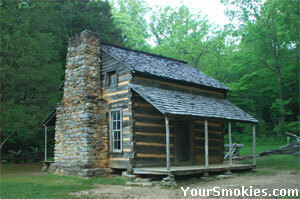 Even though it is one of the most impressive cabins in the park and incredibly well built and preserved, it is in fact the oldest home in Cades Cove. It took a lot to build such a sturdy functional building with little more than hand tools and the help of neighbors and mules to haul the felled logs to where the cabin was to be built. Gravity alone holds the logs together which comprise this log cabin. No nails of pegs needed to be used and mud was used to hold the stone chimney together as well as to making the Chinking to fill in the holes between the logs. This chinking was used to keep wind and rain out of the cabin and also helped to keep some of the vermin out that would slither or crawl between the gaps of the logs. Mornings when fog fills the field between the cabin and the road is a magical time to visit the John Oliver place. John Oliver Cabin was built in the late 1820's. John Oliver homestead and typical wood fence. Primitive Baptist Church in Cove built in 1887. 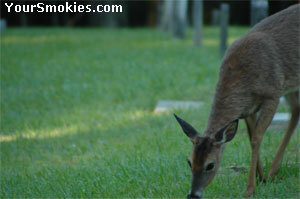 Female deer (doe) grazing in Baptist cemetery. The next stop along the Cades Cove driving tour will be the Primitive Baptist Church which will be located a 1/4 mile down a dirt road you will see to your left. Keep your eyes open on this road as I have seen many wild turkey as well as deer and once a glimpse of a bear late in the afternoon. The church that is now standing here was built in 1887 and is the first of three churches in Cades cove that served the community. 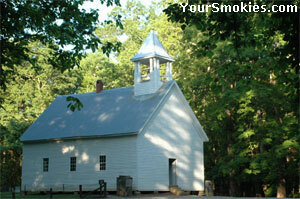 The original Primitive Baptist Church was built from log in 1827 and was indeed far more primitive. The is a little cemetary in the back of the church where you can see some of the family names you see around town in present day Pigeon Forge, Gatlinburg, Townsend, and Bryson City. When visiting cemeteries in the national park, please be respectful and stay on paths. The Primitive Baptist Church was closed during the civil war since the town was divided with both people who backed the union as well as rebels. Since this church backed the Union, many felt it to dangerous to meet being around so many confederates. You may to take your time here as this is one of the quieter spots of Cades Cove. In the spirit of Cades Cove, a blacksmith who lived in the cave named JD McCambell built this Cades Cove Methodist church in 1902 in 115 days for only $115. later on Mr Mccambell went on to become minister for this church. There were far more Baptist who lived in the cades cove than Methodist but there were enough to form a Methodist congregation in the 1820s. The original church which stood here was a simple log building. A interesting note about the construction of this church is the fact that it used building plans from another church that separated the congregation by men and women. This is why there are one small door on each side of the church rather than one large door in the center which clearly shows in the picture of the church on this page. I also love the way this huge building is just balanced on a few local rocks. The first black bear I have ever seen outside of a zoo was running in the field behind this church. When you continue on the tour there is a field now on the left where I have observed red fox on many occasions and was able to watch a coyote catch a buzzard while it was feeding on a squirrel. Always keep your eyes open when traveling the Cades Cove or any area withing the great Smoky Mountain National Park as you never know when you will run into wildlife. Cades Cove fields, meadows, and mountains. 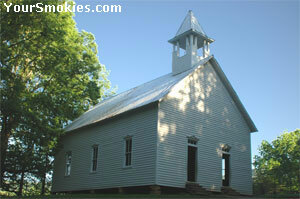 Cades Cove Methodist Church was built in 1902.